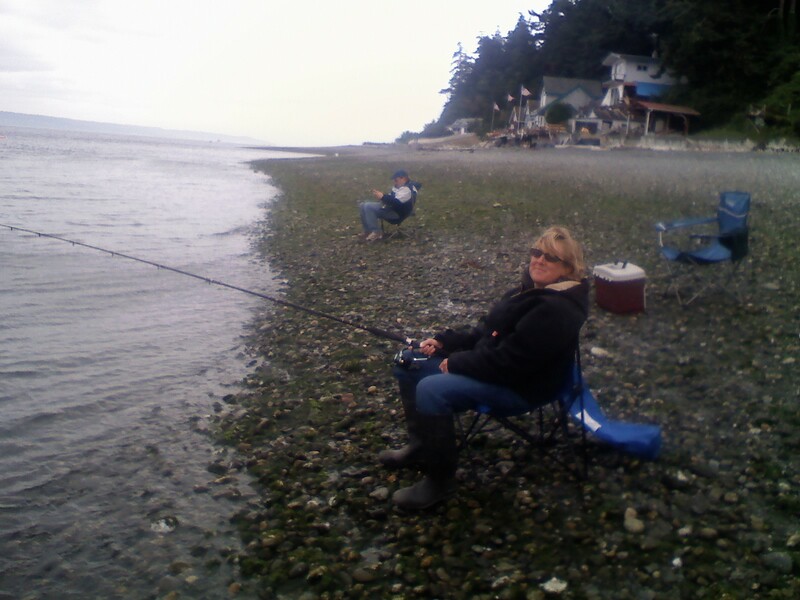 This weekend I spent a bunch of time fishing for salmon on the Southeast shore of Whidbey Island in Puget Sound. My partner loves to fish, and if I want to spend time with her during fishing season, I pretty much need to be standing next to her on the beach, fishing pole in hand. It’s a little awkward for me, because I’m actually allergic to fish – when I eat it my face blows up like a red balloon and I stop breathing. But I figured touching it would be OK and I showed up to fish on Friday evening, Saturday afternoon and Sunday evening, for a total of about 10 hours. While I was staring at my bobber in the gray waves, I had a lot of time to think about the amazing parallels between following your calling and fishing. If you’re going to love fishing, you have to actually love ALL of it. Waiting for hours not knowing if you’ll ever catch anything, cutting heads off of herring, picking the gazillionth wad of seaweed off your line, putting up with the chatty guy next to you who won’t quit smoking, and catching all sorts of things you don’t really want. For example, I caught 13 bullheads, a nasty little inedible fish with stingers on its gills. No one else on the beach caught this many, and my partner and her family started calling me “bullhead” I was catching so many. For a while I didn’t mind, because it gave me something to busy myself with, an illusion of progress. You have to love the process of fishing, and let go of whether you’ll catch any actual salmon, while at the same time believing with all your heart that the big silver fish of your dreams is just waiting for you to cast one more time. After spending so much time with my pole hanging over the water, bundled up against the August cold (never got above 70, thick cloud cover) I got into a kind of zen state. I stopped caring so much about whether I’d catch one as big as annoying-smoking-man’s. I started to appreciate my growing skill in casting, removing hooks from bullheads without hurting them and looking like I knew what I was doing. And then, Sunday night at 8:45, I pulled in my very first wild salmon, all by myself. I thought my arms were going to fall off, and I felt like God herself had sent me that fish. Made of rain, pissed off, bright silver and stronger than you’d think a fish could be. Made all the waiting, cold and irritation more than worth it. And gave me lots of energy to keep fishing. What’s your dream fish? What would make you feel like singing and doing a crazy dance on the beach in front of everyone? What are your bullheads? The things that give you the illusion of progress, but are actually distractions? What do you have to learn to love in order to love your calling? 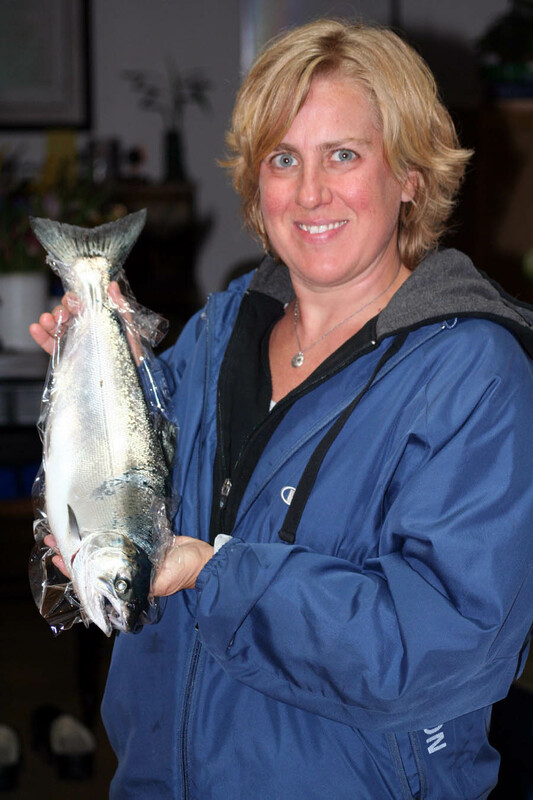 4 responses to "A Fish Tale"
Oh, Jill—- this is brilliant, on point and funny! I loved reading your fish tale– that had a happy ending. Jill, Thanks for sharing such a great story! I am not a fisherwoman, myself, since the first time I tried, I dropped my brother’s rod in the lake when I was 10….but you write about fishing for the big one just as I imagine. Great questions….I’ll take a stab. Lisa – I can relate about the childhood fishing trauma. My Grandpa was a big fisherman and a man of few words, and he wasn’t too forgiving when we made mistakes. This was definitely a healing experience for me. Would love to hear what you come up with in answer to the questions!